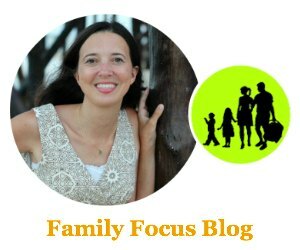 If you have been following this blog for awhile you probably know that I love Fair Trade products. You may even know the story of how I learned more about Fair Trade first hand by a Fair Trade pepper farm in Mexico and getting to attend a Fair Trade workers meeting. The bottom line is that I love that shopping Fair Trade products means that I am making a tangible difference in the lives of others and at the same time, I am getting what I consider to be a higher quality product for myself. These Fair Trade chocolate bands I will share with you today are the perfect example of how, doing good can certainly taste good! These twelve Fair Trade Chocolate Companies make products you won’t want to miss for everything from everyday use to exquisite treats. Before I tell you all about the delicious Fair Trade Chocolate Companies, I just want to give you a brief run down of exactly what Fair Trade Certified means. As fairtradecertified.org says, “From production to purchase, Fair Trade is a model of sustainable, ethical trade that puts people and planet first.” It really is all about farming practices that are better for the earth and the farmers, as well as social programs that ensure the farm workers are being treated well and compensated fairly. What does Fair Trade Certified mean? It means that the product is certified to have met the standards set for sustainable practices for the environment and workers. 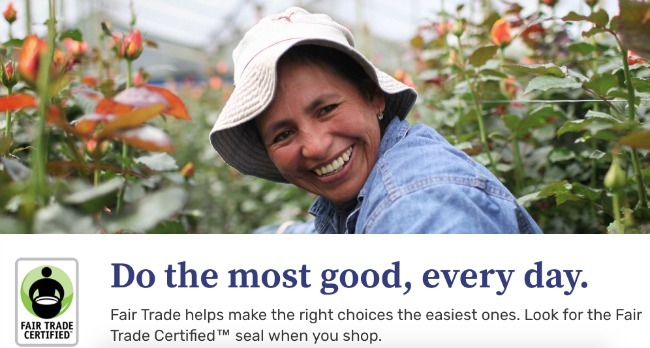 Fair Trade Certified means responsible shopping. As a lover of the environment, I love knowing that Fair Trade Certified standards work to keep the planet healthy for generations to come by prohibiting the most harmful chemicals and taking measures to protect natural resources. If you want a snapshot look at what Fair Trade Certified can mean to the life of the workers, here is the story of Mariana del Jesus Mendoza. 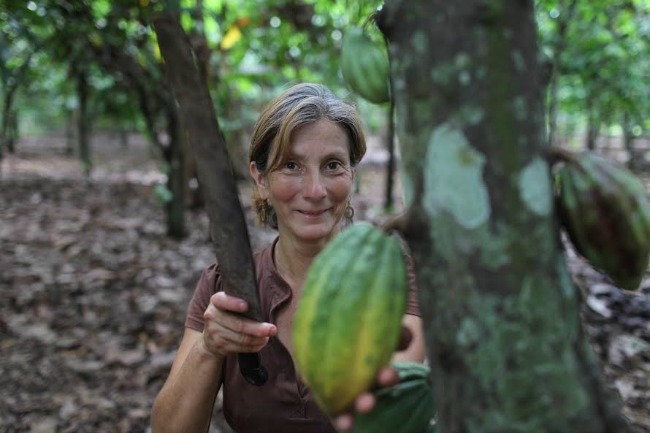 She is the matriarch of an old cocoa-farming family and one of the founding members of Fair Trade cocoa cooperative Fortaleza del Valle in Ecuador. Thin slivers of chocolate packed with fun ingredients like pretzels, almonds and coconut. Snacking never tasted so good. 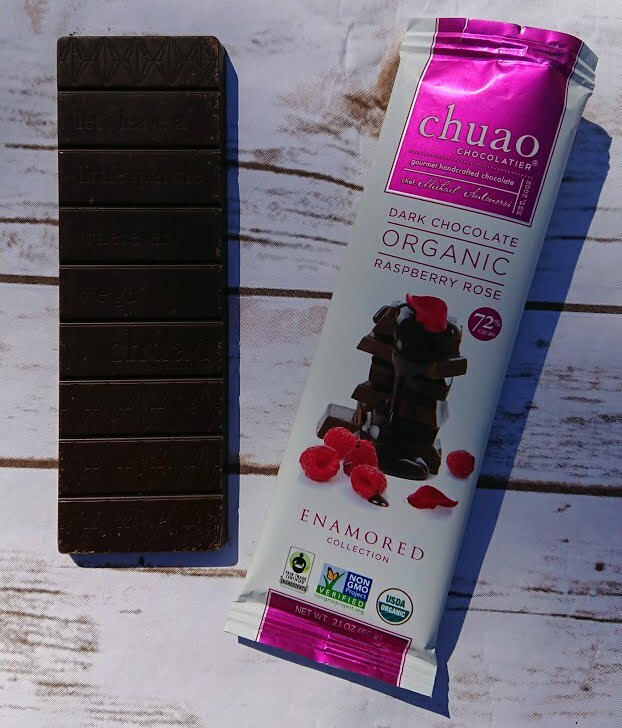 Radiant raspberries are sugared with rose petals in organic dark chocolate. It’s love at first bite. Bold cocoa notes add richness to any cookie or cake. I also love to add them to milk in a pan to make some quick and delicious hot chocolate. Sweet, ripe cherries and buttery caramels celebrate their delicious flavor under decadent chocolate. Warning: These may disappear quickly. I am wondering where mine went right now. I tried the Honeycomb in milk chocolate. 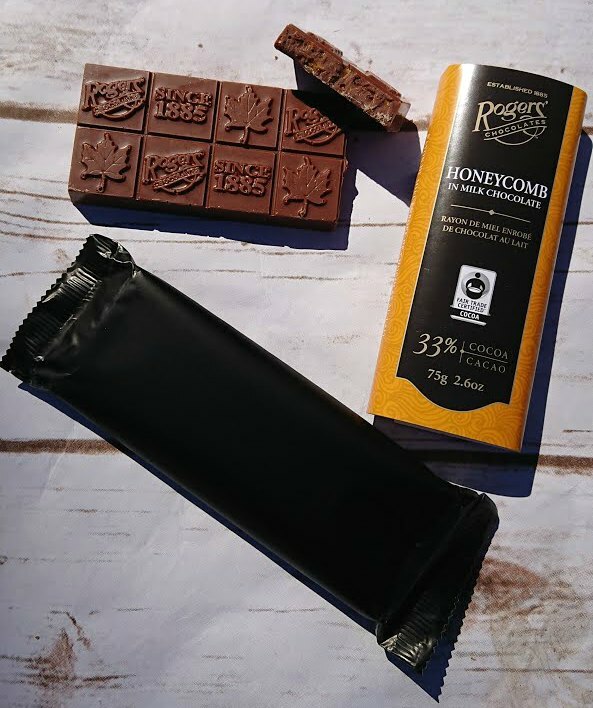 It was masterfully crafted by one of Canada’s premiere chocolatiers and it was something that I may need to try over and over because, yum! The other day I was hungry and heading out the door and I grabbed a quick UNREAL dark chocolate almond butter cup before I hit the carpool line and I was just thinking quick snack but it was a mouthful of delicious wonderful, relaxing, happy-making flavor. Maybe I should go have another right now! Experience globally-inspired flavor pairings in two delectable creations. No passport required. By total coincidence, I didn’t even realize these two chocolates had the same maker, these were the first to disappear from my Fair Trade box. And man, they were good. All natural pureed fruit pieces covered in smooth dark chocolate. You will love the contrast of the sweet fruit with the slight bitterness of the dark chocolate. 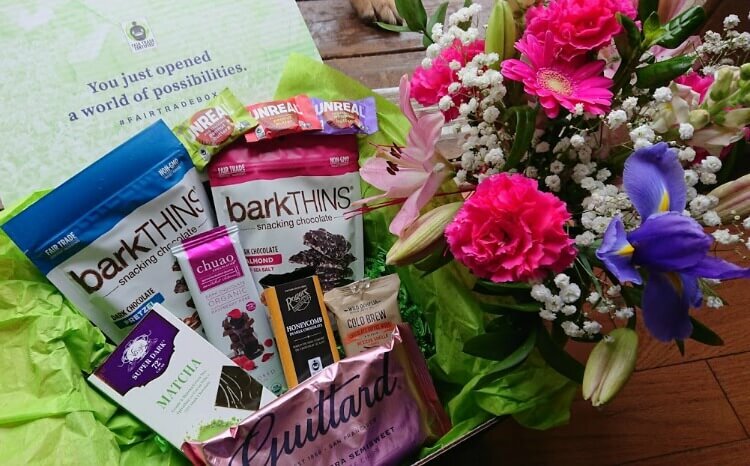 The founder of Brownie Brittle LLC, Sheila G, has launched a product extension you will love- Thindulgent Chocolate Bark! This snacking chocolate is delish! Thicker than a sliver, thinner than a candy bar, every bit deliver satisfying flavors and textures. I love these small dark chocolate balls covered in crunchy, all natural shells. On the Rocks Chocolate are available in 4 tantalizing flavors. The Moscow Mule Cordials are dark chocolate cordials boldly rolled with a spicy mix of sugar, ginger and mint and a vodka flavored (alcohol-free) center. TCHO works closely with cocoa farmers to develop unique flavor profiles in ways that benefit global communities. They has some really amazing flavor combinations that are sure to shock and excite! 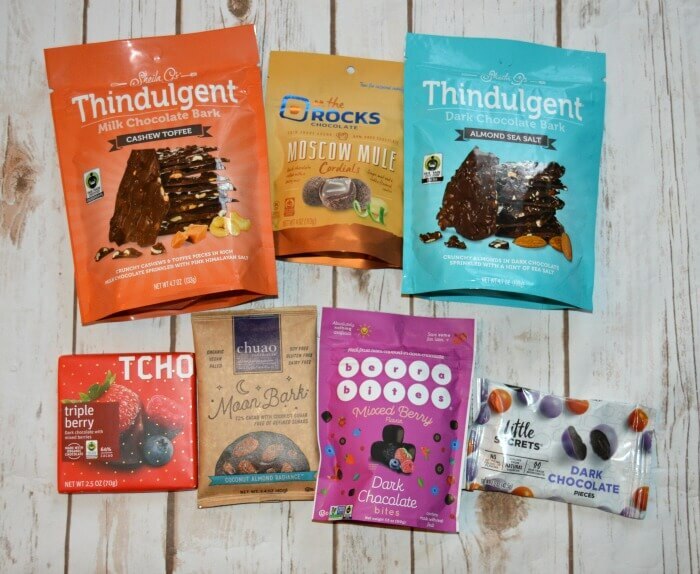 I hope you enjoy trying these Fair Trade Chocolate Brands as much as I do. I’d love to hear which Fair Trade Chocolate Companies are your favorites. Leave a comment below or tag me at @familyfocusblog with hashtag #FairTradeCertified. 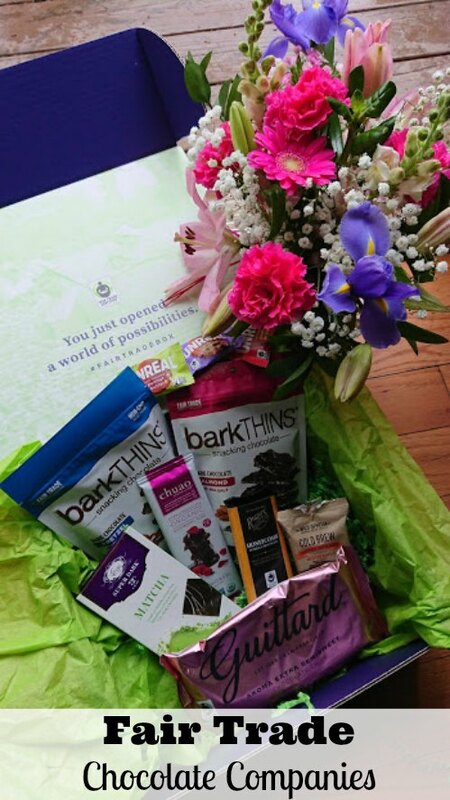 If love Fair Trade chocolates, you may also want to check out these Fair Trade foods.